Robeson sang at NMU conventions in 1941, 1943, and 1947. He spoke each time of how proud he was to be an honorary member, and of the NMU’s path-breaking role in American race relations. Lyrics to “The House I Live In” were written in 1943 by Abel Meeropol (under the pen name Lewis Allen), and the music is by Earl Robinson. The song was featured in a short film of the same name in 1945. Frank Sinatra sings the song in the film, which was made to combat racial prejudice and anti-Semitism at the end of World War II. Sinatra continued to sing it throughout his career, but Robeson too made it a meaningful part of his repertory, and was warmly applauded when he sang it at the 1947 NMU convention. 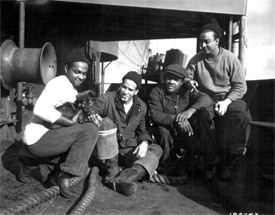 While America’s armed forces were still racially segregated all through World War II, many of our soldiers shipped overseas aboard vessels manned by racially integrated NMU crews. a certain word, “Democracy” What is America to me? and the promise for tomorrow, that’s America to me. But especially the people, that’s America to me. But especially the people, that’s the true America. Recording from “The Odyssey of Paul Robeson,” with Lawrence Brown on piano.